This is from Bread Machine Magic. I have officially decided that this is Breakfast week on The Farmers Wife. I have so many delicious breakfast recipes that I've been hoarding (in other words forgetting... haha!) to share with you, and I feel I've waited long enough! Now I don't know about your family, but ours loves breakfast foods. We eat them essentially anytime of day, but very often for dinner. With the Farming Hubby's schedule we don't often get to eat breakfast together in the morning (but seriously who does anymore? ), so i try to get that breakfast time whenever we can. Now honestly half the reason I do breakfast for dinner is I'm short on time and energy and whipping up a few eggs and some bacon and toast takes very little effort. I admit it, I have days where dinner is less than fancy. But this particular meal I actually planned out in advance (GASP!). This bread was so easy, and delicious, basically it's an English Muffin in a loaf form. But I think it's a little lighter, and better for toasting, though perhaps that's just me. This particular day I decided to make sandwich's out of this delightful bread, and let me tell you... they were SO yummy! They were the perfect comfort food on a rainy evening with a large cup of coffee. But for today I'm just giving you the recipe for the bread. You'll have to come back tomorrow for the sandwich ;-)! Place all ingredients except cornmeal in bread pan according to your bread machines directions, for most it's wet first ending with the yeast on top. Select Dough setting and press Start. When the dough had risen long enough, the machine will beep. Turn off bread machine, remove the bread pan, and turn out dough onto a lightly floured surface. Grease an 8 1/2 x 4 1/2 x 2 1/2-inch loaf pan; sprinkle all sides of dough with cornmeal and place into prepared pan. With your hands, carefully press the dough evenly into the pan. Sprinkle a little more cornmeal on top, and cover with a clean dish towel. Let rise in a warm oven for 20-30 minutes or until dough reaches the top of the pan. *Hint: To warm oven slightly, turn oven on 200 degrees for 1-2 minutes. Then turn it off and place covered dough in the oven to rise. Remove pan from the oven before preheating. * Preheat oven to 400 degrees F. Bake for 20-25 minutes. Remove from the oven, and remove loaf from the pan and let cool on a cake rake. To serve, cut thick slices. Great with Marmalade, or make into Toasted Breakfast Sandwiches. This is a really delicious, simple but light bread. Wonderful toasted with some jam or orange marmalade on it, as well as made into the sandwiches I'm sharing with you tomorrow! It keeps really well covered in foil in the fridge for up to 5 days. A great alternative to a sweet bread, or an English muffin for your breakfast/dinner meal! 4 stars. Wonderful bread. I love the easy recipes that zip together when time is pressing. ;) Meanwhile...who doesn't love breakfast for dinner? Makes me giggle every time I do it. Yum! I seriously don't think there's anything better than fresh, homemade bread! Thank you! This bread smelled amazing while baking... I love the smell of fresh bread baking, and then getting to eat it, well that just makes it even better! Lovely bread, thanks for sharing it! I love breakfast for dinner and this bread looks wonderful. Thanks for the recipe! You are welcome! 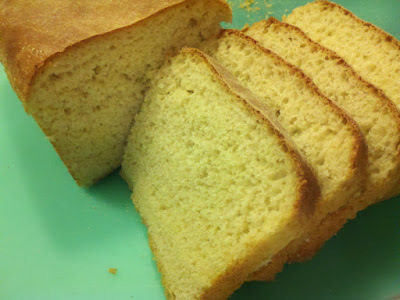 It's quite possibly my new favorite breakfast bread, as it's so simple! Thanks for checking out my blog!